I've been wanting a temporary greenhouse this summer, mainly for propagation but also to grow heat-loving veggies. 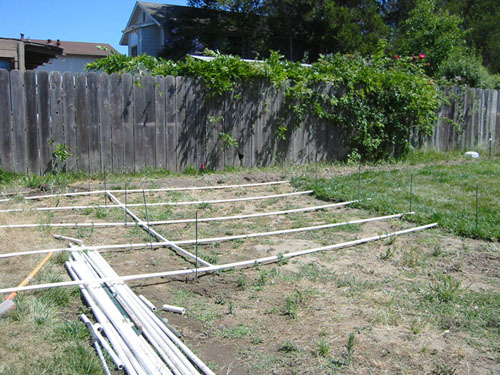 So after all my PVC work for the irrigation, I figured I could make something out of PVC pipe. 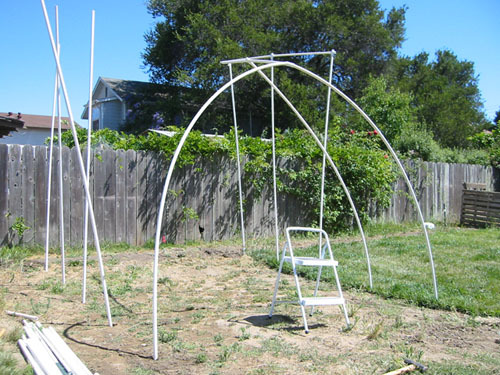 A quick web search revealed PVC hoop houses, which are basically rudimentary greenhouses, if not quite so weathertight. Last night Noel and I bought some supplies, and today I went to work. The greenhouse area was a bit messy, because we keep using it as a staging area. 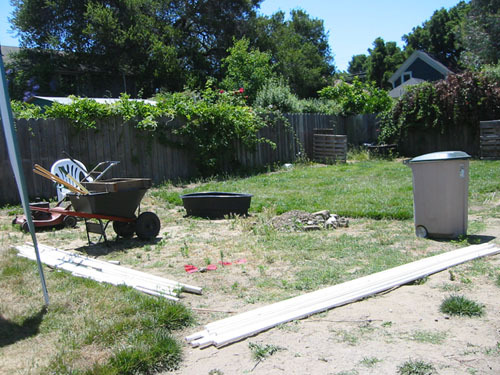 I took half an hour and shoveled out most of the gravel pile, and just moved everything else out of the way. 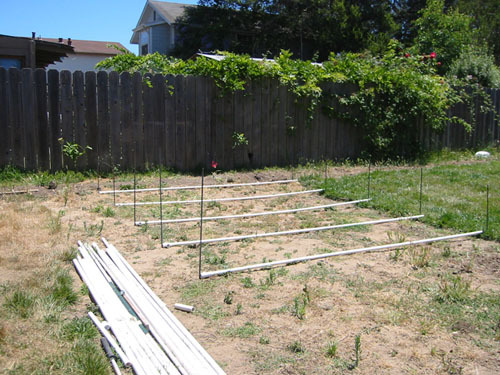 Then I spent twenty minutes laying out the base of the greenhouse. I was building one that is the same size as the real greenhouse will be: 10' x 12'. We happen to have something like a million tape measures, but with string and a one-foot ruler you can lay out any size or shape of building. Just remember that the diagonals should be the same length when the corners are square. The longest part of the process, for me, was hammering the #3 rebar stakes into the ground. 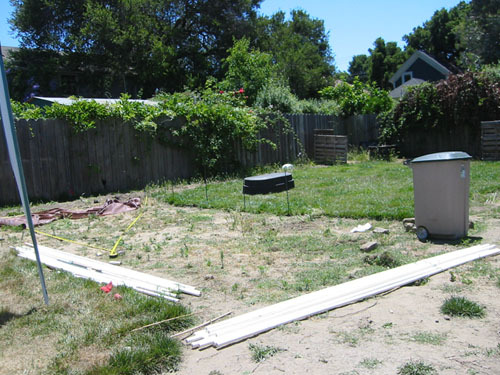 I ended up having to dig half the area up to remove rocks that were blocking the stakes. 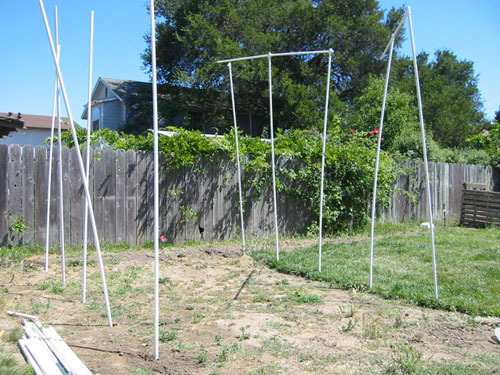 Here I checked the distance between the parallel stakes with the pipe, which conveniently comes in 10' lengths. When I had hammered the stakes in to about 18", I stuck the PVC together. I dry-fitted it because I wanted to be able to take it apart. Maybe that was my mistake. I tried a few things: hammering the rebar in until it stuck out only 8", getting up on the step-stool and forcing the pieces together, tilting the walls more. None of this worked: I would get this far and the pipes would pop apart. So now I am contemplating shifting down to 1/2" PVC, or possibly just gluing everything together and seeing if that helps. At any rate, we don't have a hoop house quite yet, but we do have an interesting piece of garden art.